go our tours. But this one was really special. As they all have been, mind. We returned to Tallinn to take on our good friends from JK Jalgpallihaigla; and then ventured over to Finland for the day, two dats later, to have a run out against the fans from HJK Helsinki. Old aquaintances met, and fresh friendships forged. What more can you want in life? If the matches against the likes of Kingstonian, Bromley, Welling & co. are our 'bread and butter' staple diet of Supporters' Team football them weekends away like this one is when we feast out on a food hamper from Harrods. If you're expecting a blow by blow account of the two matches we played then look away now. The following posts aren't really about the football, though the games will feature. For the two encounters were only the glue that bonded the time away together. It's not just about the football. But the cameraderie, the meeting of friends, and making new ones. Spreading the word of our small, albeit historic, Football Club, who we support, and without whom we would not be playing together at all. And being humbled by welcomes on foreign shores, that almost embarrass us by the warmth shown to us as strangers, but which will not be forgotten for a long, long time, and the glow of contentment from meeting such great people in both countries will warm the old cockles as we struggle in the mud of Belair Park come the wintry mornings of December & January! So read on, as I take you through our summer tour of 2008! with my bog standard 'digital box brownie' efforts that I try to kid myself are a half decent photographic record of our latest foreign foray, I am truly grateful for both the Estonians and the Finns for having a decent photographic record of our matches. There was also a match report on their website, unfortunately for us but not surprisingly, in Estonian...click HERE if you want to look at it. Snaps I'm extremely grateful for, as I clumsily accidentally deleted all of mine from here, and the tour of their Trophy Room, at the big stadium, in error, the day after. And finally a link to the official website of the Finnish First Division, where our Supporters' game got a mention HERE! We are organised, in an 'independent' sort of way, if I were putting it politely. Truth is we're not known as 'The Rabblers' for nothing, and we make our way across the Channel in dribs and drabs, hoepfully all meeting up in time for our football, or not, as the case may be. Sometimes people manage to make it to foreign climes, but are still mysteriously absent from the football, as happened to Paul Griffin not once, but twice, in Belgium in the past. In 2005 he appeared at the ground in the middle of nowhere on the outskirts of Liege, appearing out of the woods, halfway through the RFC Liege tournament. And a year later he got as far as Namur, but failed to get to the ground at CS Onhaye at all! But I digress..this is about 2008! Anyway a few of us went along to this match, which was enjoyable enough to watch, and it was Irish eyes that were smiling, with a one nil victory, an 'away goal' no less, to clinch the tie three one on aggregate. This was followed by a dash to meet us with some of the others, who had been sampling the local ales, so to speak, as we went to the small ground next to the National Statium, where are opponents JK Jalgpallihaigla, from the fourth division, had an Estonian FA Cup match away to FC Elva, from the second division. Despite clearly being second best, they had a number of chances. and i thought did themselves proud in only going down by the odd goal in three. This was the old scoreboard, at halftime, in the Kadriogu Stadium. this was my 'pick' of their flags. our squad who have an eye for the ladies! And here is the 'Rabblers' contingent at the match! And so onto the less salubrious setting of the Sportland Arena! Jalgpallihaigla are in the green. Not just those who couldn't find the time away from work, or families, to travel with us, but those who DID but erm, didn't! First up, probably the unluckiest man in the squad Ian Gannon. He broke his foot a month before we were due to travel, and was thus ruled out of a run out. But he'd booked his flight, paid for the hotel, and was planning a nice break away with his kids & sister in law. Broken foot, new customised boots bought for the trip, and then injured. What else could go wrong? Erm, on getting to the airport there was a problem with his young daughters passport documents. So his older boy travelled on with his sister in law, and he would fly out with his girl the next day. A hiccup that could easily be overcome. Except that the very next day the Passport Office were beginning a three day strike, so trip cancelled for him. So Ian still remains a 'tour virgin'! And what about Matt Hammond? He was looking forward to another tour, having been on a number of the previous ones, including our first trip abroad, to Amsterdam, back in May 2002. But unlike Ian he never even got as far as the airport! He spent the entire twenty four hours before his flight searching in vain for his passport, and turned his house upside down in the process! Apparently he gave up searching at just before four in the morning, a few hours before his flight! Whilst we might all smile at their 'misfortune' I was genuinely sad not to see them make the trip, and hope they are available for our next tour, wherever that may be. Despite having been a touring side now since May 2002 there are still a number of our lot who have not been abroad with us before. The 'tour virgins', so to speak! What made this trip a bit unusual was that there were no less than four of them-three of which were making their "Rabblers" debuts to boot! 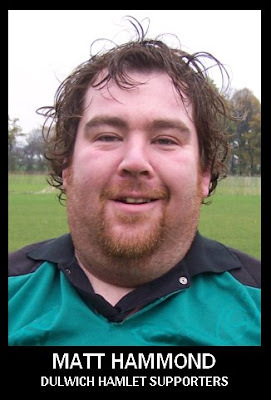 Shaun Dooley is an old veteran of the team, having been a major part of our earlier years, including a spell as manager. He returned to playing last season, but was only expecting a 'few minutes' on foreign soil on this trip, as he had suffered a recurrance of an old knee injury in the seven-a-sides a few weeks before. But he played the whole tour between the sticks, with trademark bandana, after a passportless Matt Hammond failed to appear. The new three were Mick Spencer, despite the grand 'Diana-esque' surname he is as 'rough & ready' as you can get! Introduced to the Hamlet terraces by his ex-work colleague & mate Dawn Taylor, hopefully he'll have some more run outs for us this coming season. His professional team is Reading, despite the fact they've knocked the Hamlet out of the FA Youth Cup twice in the past, he's a great addition to the squad! Next up is Stephane Tournay. 'On loan' to us for the tour from our Belgian Second Division counterparts from the home town of another very good Belgian friend of ours, Nicolas Lucas, UR Namur. He was part of the Belgian group who came over & cheered the Hamlet on, at home to Sittingbourne last season. He was made honourary captain for the match against Jalgpallihaigla, which is why he has a pre-match memento to present them in his hand. One thing I like to do when I go abroad is visit museums and see the sights. Last year I-to my disappointment, even though I enjoyed myself-I only visited one museum. This time I was over here for longer, flying in Wednesday, & getting the plane back a week later, so I got a chance to see a lot more. I went to Helsinki a day before the majority of the team, and got the early Saturday boat to Helsinki, with Larry Marsh & Andy Tucker. But I failed to get to our rendevouz on time at Helsinki station on time at 2.00pm, so you're spared any touristy snaps I might have taken with them. Instead I have a few from Tallinn, just before. On the Thursday a few of us took a train to a coastal town called Paldiski, where we got lost a bit and wandered through some woods, looking for old Soviet military bases, listed in (maybe an old?) Lonely Planet, but which had since been demolished! But it was still a pleasant day, in good company. At least I wasn't in the group led by 'tourguide' Griff, who went out to the television tower in Tallinn, only to find it shut! where we were 'yomping'. At one stage we bumped into a local. Dawn decided to ask him for directions. At which point she said very loudly to him "WINDMILL"
"tourists", which appeared to be the only English he spoke! visitors' book not once, but twice? Mick couldn't stop playing with the exhibits! and more troops arrive, to bolster the advance party. including Lucas Green. Where on earth did he get that shirt? Surely the biggest fashion faux pas since Myles Quinn (sadly pre-digital camera days) in Rimini? Before being 'kicked out' at closing, & into the adjacent still open nightclub! Not the busiest of places, & despite the handbag to jive around Griff refuses to hit the dancefloor. 'Broken hearted' after being spurned by Dawn, who he asked to dance! Apparently he refused to dance the night away as there were only blokes out there..
Blokes? Oh come on Griff...lighten up. It WAS only Shaun & Stephane, drunkenly strutting their stuff! Before I continue it's about time I showed you the team photos from the two matches to come. To me they sum up the spirit of our trips. Both sets of teams happily being snapped together after the matches. True friendship, and mutual respect. What more can you want? Shaun Dooley; Steve Rickerby; Darren Nicolas; Phil Baker; Mick Spencer; Andy Tucker; Lucas Green; Dawn Taylor; Stephane Tournay; David O'Shaughnessy; Larry Marsh; Mishi Morath; Paul Griffin; Mark Hutton & Mick O'Shaughnessy. As already mentioned we lost 7-1. Was this a fair result? Probably not, we deserved a goal or two more, but it did reflect the gulf between the two sides. They are much better than us, and play regularly in the Estonian Fourth Division, and seemed even stronger than last season ,when they beat us 10-6! But despite the heavy reverse it was a friendly game, and we battled gamely on, never giving up in a still intense early evening heat. For sure we will return to Tallinn at some stage in the future, maybe not next year, but maybe the year after? Who knows? One thing for sure...Jalgpallihaigla are a wonderful bunch to play against, despite being clearly better than us! Cheers to Madis & co, for their hospitality! Hopefully they can return to London to play us, having been runners-up in our 'Pa Wilson Cup' last year, which we staged at Champion Hill Stadium. Meeting up at team HQ Hotel Olympia. Team group outside before we head off to the ground. Pre-match managerial discussion before the match. off, and was surprised when Mishi told him it was at 7.00pm! You've overdone the sunblock there Hutty! Is that a GENUINE Martin Eede flat cap worn by Mr. Dooley? Didn't take Hutty long to nick that cap! Mick gets closer to Dawn than most of the team ever have! Lining up before kick off, as is often the continental way. addition to our Supporters' team memorabilia. And so on to some decidedly average 'action' shots! Shaun in command of his area. Last year Lucas bemoaned the fact I took no photos of him. Is it me, or is Darren a bit too nonchalant on our back post? Phew! At last! Half time & a much needed break. temperature dropping, it was still in the seventies! Some don't seem to be paying too much attention though! Larry relaxes, while Griff gets ready to throw up again. no-one else falling ill, who ate at the same place. Only another 45 minutes to go! by a hot air balloon! Debutant David takes a much needed breather! The Jalgpallihaigla fans made all the noise! At the final whistle we had a penalty competition. Too knackered to stand in a group huddle. the match. As we wore some of their scarves round our necks. Trust these two to get to them first! Father & son pose for the family album. Hutty adorned in all the local gear. this sit down! Well done Dawn! And another look at the team photo. Just what is Stephane up to? Oblivious to the fact Stephane is entangled behind him! After that it's the pool! Now for the big match! And that was the tour!